This collection of interviews explores the role of religion in the lives of eminent South Africans who led the struggle against apartheid. Nelson Mandela, Chris Hani, Desmond Tutu, Nadine Gordimer, and seventeen other political, religious, and cultural leaders share the beliefs and values that informed the moral positions they adopted, often at great cost. From all ethnic, religious, and political backgrounds, these men and women have shaped one of the greatest political transformations of the century. What emerges from the interviews are reflections on all aspects of life in an embattled country. There are stories of the homelands and townships, and tales of imprisonment and exile. Dedicated communists relate their intense youthful devotion to Christianity; Muslim activists discuss the complexity of their relationships with their communities. As the respondents grapple with difficult questions about faith, politics, and authority, they expose a more personal picture: of their daily lives, of their pasts, and of the enormous conflicts that arise in a society that continually strains the moral fiber of its citizens. Taken together, these interviews reveal the many-faceted vision that has fueled South Africa's struggle for democracy. 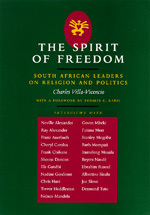 Charles Villa-Vicencio is Professor of Religion and Society at the University of Cape Town. Thomas Karis is Professor Emeritus of Political Science at the City University of New York and Senior Research Fellow at the Ralph Bunche Institute on the United Nations. He is the coeditor of From Protest to Challenge: A Documentary History of African Politics in South Africa.